Undertaking a research degree provides you with an exciting opportunity to determine your own research specialism. By choosing to study with us, postgraduate students benefit from working with specialists in their respective fields who have national and international reputations. Students undertaking research degrees register for the award with which they intend to graduate either a PhD (Doctor of Philosophy) or an MPhil (Master of Philosophy). If you are interested in doing a research degree, please complete Section 1 of the Application to Register on a Postgraduate Research Programme Form and email to pgradmissions@chi.ac.uk. This form is circulated to the appropriate academics and any supervision options identified. An interview can then be arranged. You can access the Application to Register Form here. We welcome potential postgraduate students in all of the subject areas listed below. The UK government is to introduce a new loan scheme to provide funding of up to £25,000 to fund a postgraduate doctoral degrees. The loans will be valid for those students beginning their programme in the 2018/19 academic year (i.e. from October 2018) and is not means tested. You must also be aged 59 or under and not already hold a doctoral level qualification. Applicants will need to apply separately for funding when the loans are launched in spring/ summer 2018. You can read more about the scheme on the UK PhD loans page on the FindaPhD website and on the gov.uk website. Please note the amount of the loan will be paid over the maximum period of candidature (four years for full time and seven years for part time). The standard requirement for an MPhil/PhD is a first or upper-second honours degree and/or usually a relevant Master's degree. Candidates with other qualifications are considered individually on their merits. All students are interviewed by their potential supervisor(s) and a Research Degree Coordinator or nominated other. The research project must be 'approved' by the Research Degrees Group 3 months (FT) / 6 months (PT) into candidature. The Research Degrees Group will take account of the field in which you wish to work, the availability of resources, the nature of the University’s current research strengths, and the particular needs that you may have for specialist facilities. All projects are considered by two experienced scrutineers who advise on the strengths and weaknesses of the research proposals presented to the Group. The Higher Degree Regulations and Code of Practice for the Supervision for Research Candidature and Supervision download. 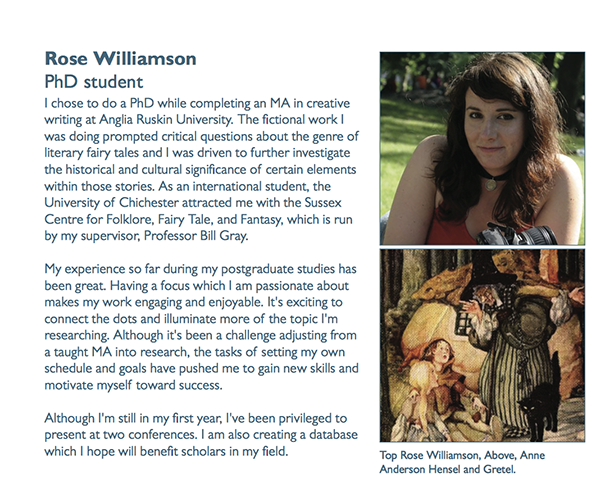 Click on the photo below to read students experiences of doing a PhD. Chichester is a small town with a big University: that is my impression after a PhD internship at the University of Chichester. The internship was part of an exchange program funded by a Brazilian institution (CAPES). The University of Chichester had never received a student from such a program, but they easily figured out the paths to make everything work out for me, from accommodation to library access. I had never seen such a helpful team! The Accommodation, Research, Library, and International Offices worked together to make this experience the best it could be! The professors are open and willing to share knowledge; the Library is full of updated resources; the Campus is cozy and feels familiar; the Restaurant has delicious food and enthusiastic staff! 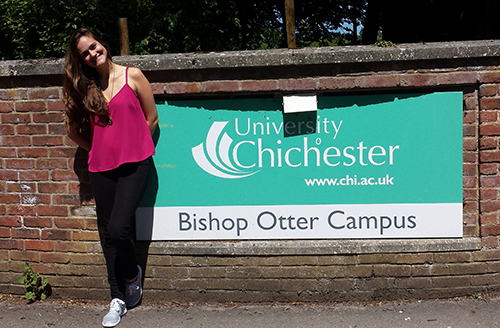 The University of Chichester enriched my research and my personal life!